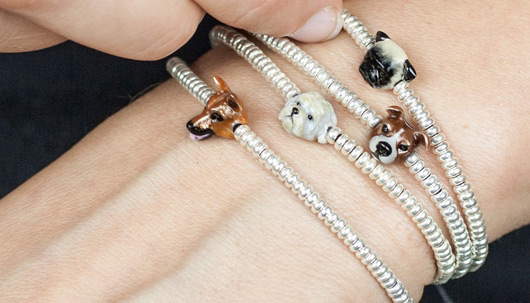 Dog-lovers can wear their emotion on their sleeve – literally – when they wrap their wrists in a bracelet from Dog Fever! There are several handcrafted sterling silver fun-loving designs to choose from, including a hug bracelet; and a head bead bracelet, both produced in all-silver and silver with richly colored enamel. The hug styles feature the full body of your best friend, while the head style puts the focus on your buddy’s face. Whichever one you choose, your bracelet has been designed in Italy by artists who share your passion for pups. Dog Fever bracelets are a stunning symbol of the bond shared between a person and the dog who owns their heart!